Intraocular foreign bodies (IOFBs) resulting from penetration into eye chambers are usually accompanied by notable visual impairment. We report here in a 62-year-old man with asymptomatic IOFB for 30 years. His uncorrected visual acuity was 20/20 in the right eye and 20/40 in the left eye. He had not been treated because he did not experience any discomfort until gradually decreased of visual acuity science 2 years ago. IOFBs can be harmful because a penetrating ophthalmic wound, while they may be associated with no inflammatory signs for many years as in this patient’s clinical presentation. Intraocular foreign bodies (IOFBs) resulting from penetration into eye chambers, accounted for 18-41% of all open injuries . The complications of IOFB depend on the nature of the material, which penetrates into the ocular tissue. It has been reported that metallic foreign bodies are more common than other materials naturally. They can induce traumatic cataract and intraocular inflammation, which may cause emergency interventions because of visual deterioration or even eye loss . However, they have been rarely reported to remain in the chambers for long time without resulting in visual impairment. IOFBs can be found in the anterior segment such as cornea, anterior chamber, anterior chamber angle, in the posterior segment (vitreous cavity) or they can even be embedded in the retina/sclera . The management of IOFB depends on presentation of the problem and surgically clinical assessment. They can be removed by an intraocular magnet or a surgical process, so the decision of surgical interventions should be based on different factors including the chemical composition of the foreign body, size and the potential for infection. Non-metallic intraocular foreign bodies may remain quiescent for many years, while intra chamber metallic foreign body has rarely been reported in the literature. In this report, we present a case of anterior chamber metallic foreign body in place for 30 years with inappropriate symptoms. A 62-year-old man was referred to our ophthalmology department- Nikookari hospital for the first time because of gradually decreased visual acuity in his left eye since 2 years ago. There was a history of ocular trauma while hammering approximately 30 years before the first ophthalmologic visit. He has not felt any discomfort; therefore he did not refer to a physician. On the first examination, his uncorrected visual acuity was 20/20 in the right eye and 20/40 in the left eye. He was presented with orthotropia at far and near distances without correction. The manifest refraction revealed sph=-0.5D cyl-0.25D axis 180° in the right eye and sph =-1.5D cyl-2D axis 120° in the left eye. The best-corrected visual acuity (BCVA) was 20/20 in the right eye and 20/25 in the left eye. The intraocular pressure was determined 13 mmHg and 12 mmHg in the right and left eye, respectively. The evaluation of Relative Afferent Pupillary Defect (RAPD) was negative. On slit-lamp examination, a spot like pigmentations on the corneal endothelium were detected without corneal edema. There was also an old scar with sharp borders sized of 2×2mm in the mentioned area. The anterior chamber showed cell reaction 0.5+ and flair 1+. 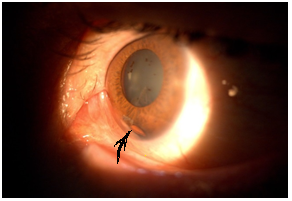 The iris was perforated in 6 o’clock hour position and there was an iris cyst nearby the perforation, and iris adhesion was also detected around the foreign body situation (Figure 1). At the same described site of iris, a metallic foreign body without any membranous capsule was found to be fixed to iris at the upper site of perforation (Figure 2). In further investigations there were not alteration of the pigmented epithelium and iris stroma. Moreover, Posterior synechiae at the pupillary border was not observed. Lens examination was also conducted, where different pigmented spots on the anterior capsule were discovered. Besides, nuclear cataract sclerosis was detected without traumatic cataract signs. 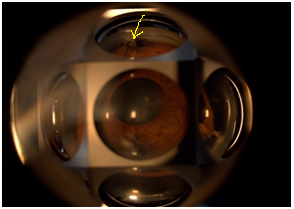 Figure 1: Retentional foreign body in slit- lamp view. Figure 2: Retentional foreign body in gonioscopic view. In addition, dilated fundus examination of the left eye did not reveal any pathologic abnormalities in the anterior vitreous. The disk and macula were intact in the left eye. The axial and coronal orbit CT scan results reported a metallic foreign body near by the anterior surface of left lens (Figure 3). Scotopic ERG determined a wave amplitude 30 dB and b wave 78 dB, that indicative for mild decrease in both amplitude waves. Photopic ERG did not show any changes in amplitude waves. Decrease of visual acuity is justifiable with nuclear cataract sclerosis and mild uveitis. The patient treated with topical anti-inflammatory (eye drop betamethasone) and mydriatic/cycloplegic (eye drop homatropine) and followed up for response to our medication. Figure 3: Intraocular foreign body in axial view of orbital CT.
Intraocular foreign bodies can cause ocular damages due to penetrating injuries and related complications or foreign body infection. They can induce chemical inflammatory reactions particularly if they contain iron (siderosis) or copper (chalcosis) [4-6]. Most of the patients with retained intraocular foreign bodies developed cataract formation which results in impaired vision. Other complications of retained IOFBs could be uveitis, glaucoma, endophthalmitis and intraocular metallosis and Siderosis bulbi. Thus, IOFBs require prompt evaluation and management; as they might lead to threatening complications of the vision. History taking and ocular examination are two keys of IOFBs diagnosis . Radiologic imaging such as plain X-rays, ocular ultrasonography, computed tomography and magnetic resonance can be used for the detection and localization of the penetrated object [7-10]. Plain X-ray is known as a screening modality for IOFBs, while localization of IOFBs without limbal ring is one of the limitations of this method. B-scan ultrasonography is able of detecting metallic IOFBs, however the sensitivity is operator dependent and the use of ultrasound is contraindicated in globes suspected of rupture. CT scan is currently considered as the gold standard of diagnosis, not only formetallic bodies, but also for non-metallic IOFBs, while MRI is contraindicated to detect metallic IOFBs. Magnetic Resonance could be considered as the best choice of diagnosis for non-metallic foreign bodies . Clinical features associated with better visual acuity outcomes include better presenting visual acuity, absence of clinical endophthalmitis, non-virulent organism culture, non- retinal detachment, small sized foreign body, minimal involvement of other intraocular structures and immediate surgery [12-14]. Management of IOFB includes initial assessment of its size, site, material, potential for infection, and degree of lenticular and other intraocular damage. Small metallic foreign bodies which do not affect the visual axis, accompanied with clear lens and without intraocular damage or inflammation are often conservatively treated with topical antibiotic and steroids. If any complication develops, the removal of the foreign body would be necessary . IOFB surgery includes wound closure for prevention of endophthalmitis and removal of IOFB, which should be planned immediately by means of an elective surgery . It has been proved that delayed repair of these wounds could increase the risk of expulsive hemorrhage and extrusion of intraocular contents plus the infectious complications . Anterior segment foreign bodies can be removed at the time of primary repair but removal of posterior segment foreign bodies depends on surgeon’s clinical assessment. Arnaiz et al. [18,19] have suggested that the reason for prolonged asymptomatic retained IOFBs might be IOFBs encapsulation by a thin membrane at the area . They also reported a case of noninfectious endophthalmitis, induced by a retained IOFB in the posterior wall of the left eye for 16 years . Lin et al. also reported an occult plastic intravitreal foreign body which has been retained for 30 years. It was accidently discovered and removed through the cataract operation. A case presented by Al-tamimi described a peculiar case of a retained inert piece of fireworks placed in the anterior chamber for more than five years. It was reported as non-mobile object, placed out of endothelium and without inflammatory reaction. As the foreign object has not impaired the patient’s vision, it was decided to be followed conventionally . The intraocular foreign body of this report occurred as an occupational hazard by hammering. It was entered through the peripheral cornea. Studies have confirmed that the portal of entry for intraocular foreign bodies is predominantly corneal . In addition, patient’s visual acuity did not seem to be affected as any pathological changes were not detected in the injured eye. Findings from this report implied a rare possibility of intact vision while the presence of intraocular metallic foreign bodies. The explanation for the recent vision impairment in this patient is justifiable with nuclear cataract sclerosis; however despite the presence of the prolonged metallic foreign body, the vision was not greatly affected. Zhang Y, Zhang M, Jiang C, Qiu HY (2011) Intraocular foreign bodies in china: clinical characteristics, prognostic factors, and visual outcomes in 1,421 eyes. Am J Ophthalmol 152(1): 66-73. Macarie SS, Macarie D (2004) Complications of intraocular foreign bodies. Oftalmologica 48(3): 57-60. Arora R, Sanga L, Kumar M, Taneja M (2000) Intralenticular foreign bodies: report of eight cases and review of management. Indian J Ophthalmol 48(2): 119-122. Hasanreisoğlu B, Turaçlı E (1987) Eye traumas. 7th Ophthalmology course, pp. 133-143. Mieler WF, Ellis MK, Williams DF, Han DP (1990) Retained intraocular foreign bodies and endophthalmitis. Ophthalmology 97(11): 1532-1538. Vatavuk Z, Pentz A (2004) Combined clear cornea phacoemulsification, vitrectomy, foreign body extraction, and intraocular lens implantation. Croat Med J 45(3): 295-298. Arnáiz J, Marco de Lucas E, Piedra T, Torres M, Blanco G, et al. 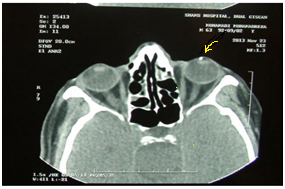 (2006) Intralenticular intraocular foreign body after stone impact: CT and US findings. Emergency radiology 12(5): 237-239. Pavan-Langston D (1991) Burns and trauma, ‘Manual of ocular diagnosis and therapy’. (3rd edn), Little, Brown and Company, Boston, USA, pp. 31-55. Mackiewicz J, Krupski W, Haszcz D, Zagorski Z (2001) Localisation of intraocular foreign bodies using computed tomography. Klin Oczna 103(1): 21-23. Farajpour R, Ahour M, Farajpour S, Bagheri M, Asadollahi M (2015) A case of retinal damage caused by green laser pointer. Adv Ophthalmol Vis Syst 2(5): 00063. Nair UK, Aldave AJ (2007) Cunningham ET Ophthalmic Pearls: Trauma. In: Scott IU & Fekrat S (Eds. ), Identifying intraocular foreign bodies. EyeNet Magazine, USA. Slusher MM (1989) Intraretinal foreign bodies. Management and observations. Retina 10(Suppl 1): 50-54. Jonas JB, Knorr HL, Buddle WM (2000) Prognostic factors in ocular injuries caused by intraocular and retrobulbar foreign bodies. Ophthalmology 107(5): 823-828. Faraji E, Nakhjavani MRJ, Mashrabi O, Maleki SF, Maleki RF (2016) A Brief Review of Mucormycosis: Report of Five Cases. BJMMR 11(9): 1-5. Kumar A, Kumar V, Dapling RB (2005) Traumatic cataract and intralenticular foreign body. Clin Exp Ophthalmol 33(6): 660-661. Katz G, Moisseiev J (2009) Posterior-segment intraocular foreign bodies An update on management. Risks of infection, scarring and vision loss are among the many concerns to address. Retinal Physician 20. Pieramici DJ (2005) Open globe injuries are rarely hopeless. Managing the open globe calls for creativity and flexibility of surgical approach tailored to the specific case. Rev Ophthalmol 12: 6. Arnáiz J, deLucas EM, Piedra T, Torres M, Blanco G, et al. (2006) Intralenticular intraocular foreign body after stone impact: CT and US findings. Emerg Radiol 12(5): 237-239. Ahn M (2001) Noninfectious endophthalmitis caused by an intraocular foreign body retained for 16 years. J Korea Ophthalmol Soc 42(5): 793-796. Lin HC, Wang HZ, Lai YH (2006) Occult plastic intravitreal foreign body retained for 30 years: a case report. Kaohsiung J Med Sci 22(10): 529-533. Al-tamimi RE (2014) A peculiar case of a retained inert piece of fireworks as an intraocular foreign body in the anterior chamber. Saudi J Ophthalmol 28(3): 225-227. Pam VA (1994) Intraocular foreign bodies: Guiness ophthalmic unit experience. Nigerian Journal of Ophthalmology 2(2): 1-8.